As much as I’ve loved living outside of Kansas City at different times in my life, the fact that I’m now raising my children less than a tenth of a mile from my childhood home is such a treat. Pushing a stroller down the same sidewalk I was pushed down. Ringing the same neighbors’ doorbells at Halloween. Watching my oldest, her face tattooed with a sparkling firework and red, white and blue ribbons in her hair, celebrating the 4th of July with our neighborhood just as I did all those years, all those years ago, as a kid. It’s all such a treat. And it was a treat this past year to remodel the home I grew up looking at out my bedroom window. It was a house I’d never been inside – only seen on a thousand walks, driven past on a thousand commutes home. 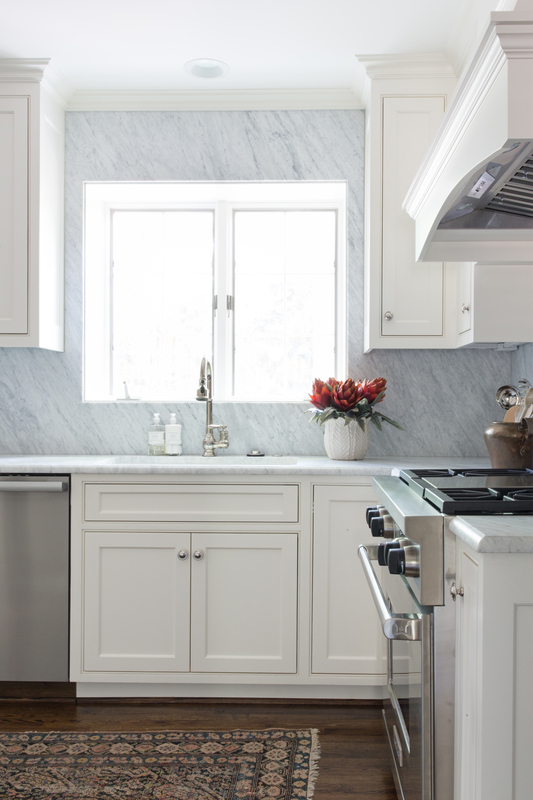 These homeowners – new to the neighborhood since I’d been a kid – needed a new kitchen. They deserved it. The house deserved it. It was settled. 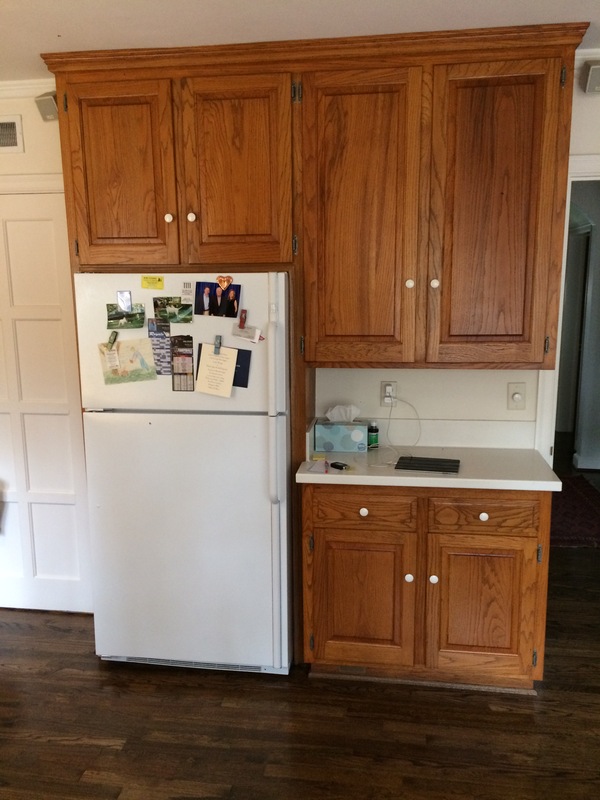 Out with the old golden oak cabinets and white appliances and in with custom cabinets, and marble slab backsplash. I like each job for different reasons. 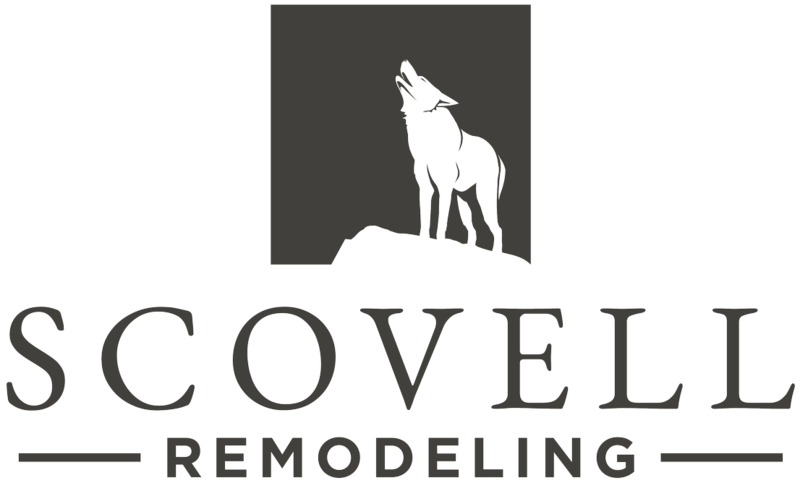 Some, it’s the clients that I adore; others, the charm of the house; and others still, the design of the remodel. This particular job however, was a good bit of all three. The house isa beautiful tudor, filled with family heirlooms and fabulous rugs. The clients were kind, trusting and decisive. 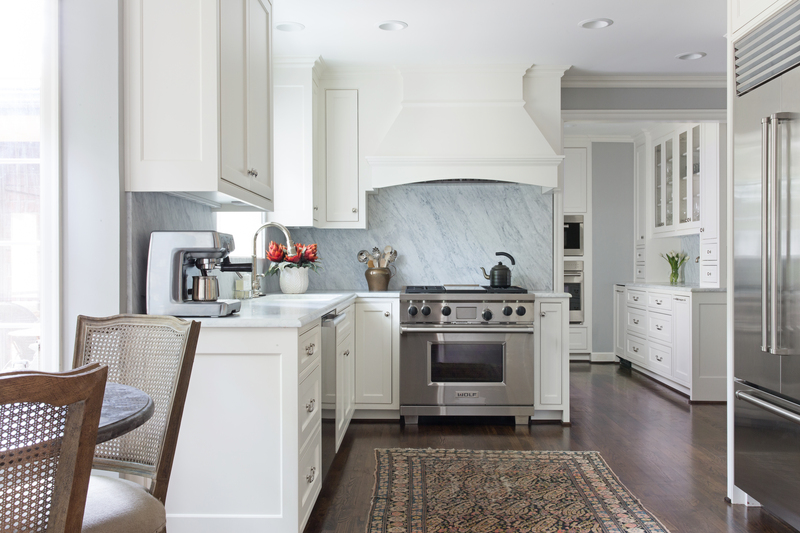 The design of the remodel was seemingly simple – no big addition – yet important in all the meaningful ways. 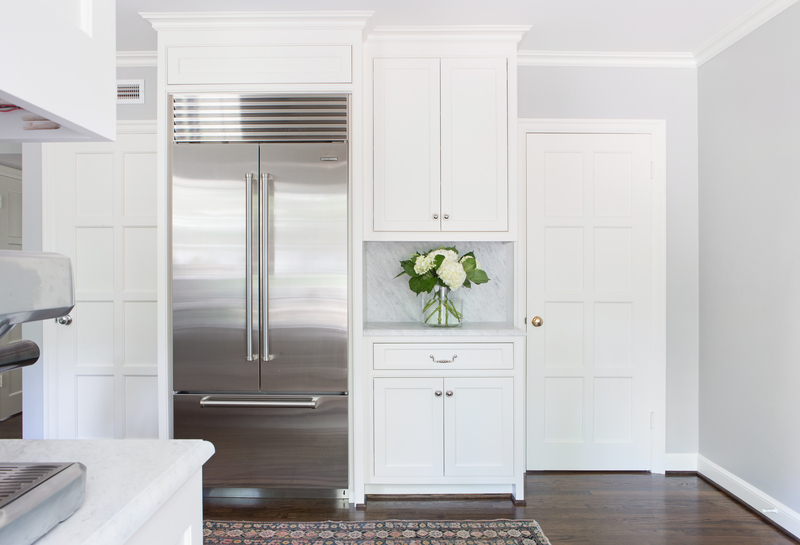 The biggest “overhaul” we did was convert the back hallway (which had once led to a back stairwell – long since covered up in a previous remodel) from a tight little corridor, acting as a makeshift laundry room, pantry and broom closet, into a classic and stunning wet bar. 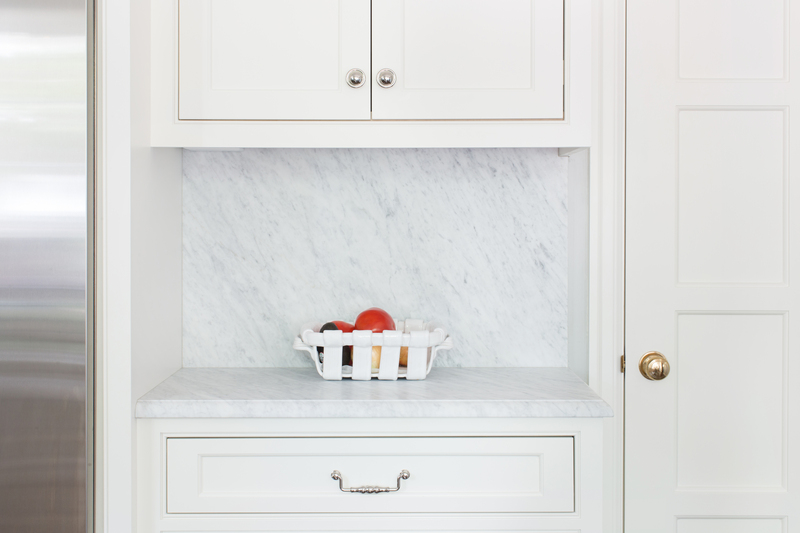 We chose inset cabinets for their simplicity and clean lines. 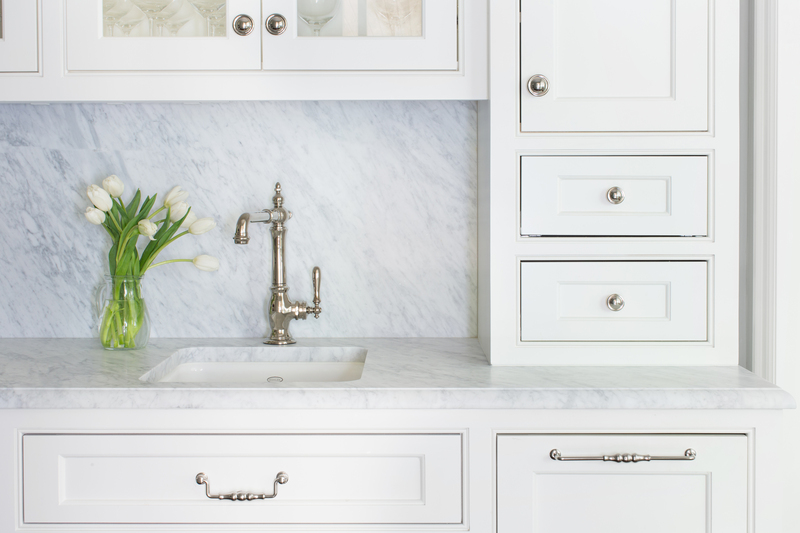 A creamy white undermount sink was paired with a satin nickel faucet. 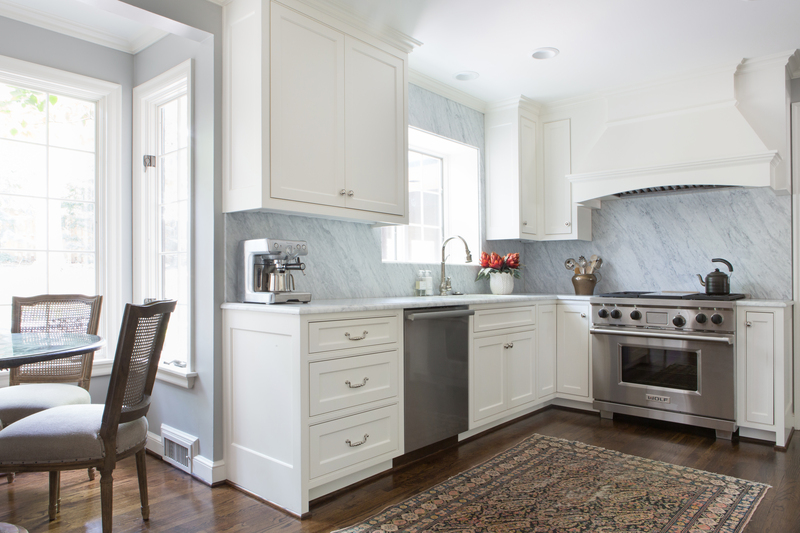 Carrara marble slabs from Carthage Stoneworks wrap the space flanked by full height upper cabinets, which sit on the marble top itself. 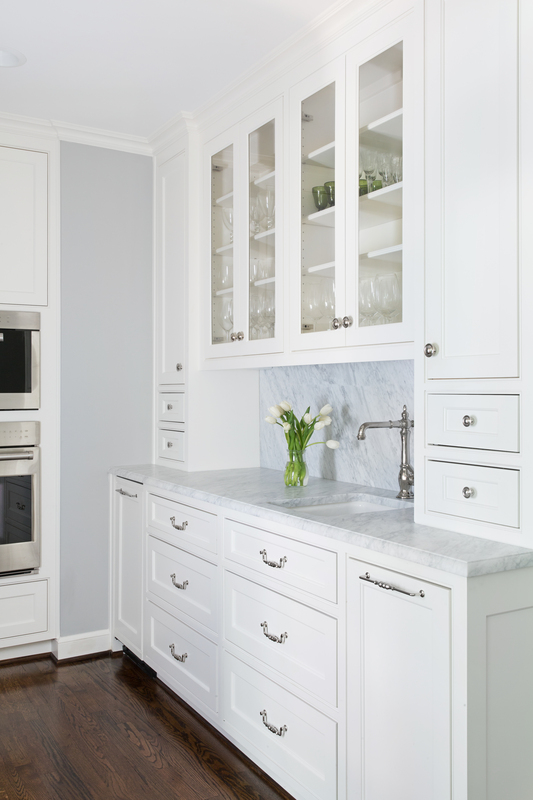 Glass-paned uppers reveal the clients’ glassware, while solid lower cabinets hide the couples’ liquor, and drawers are filled with cocktail napkins, corkscrews and wine stoppers. 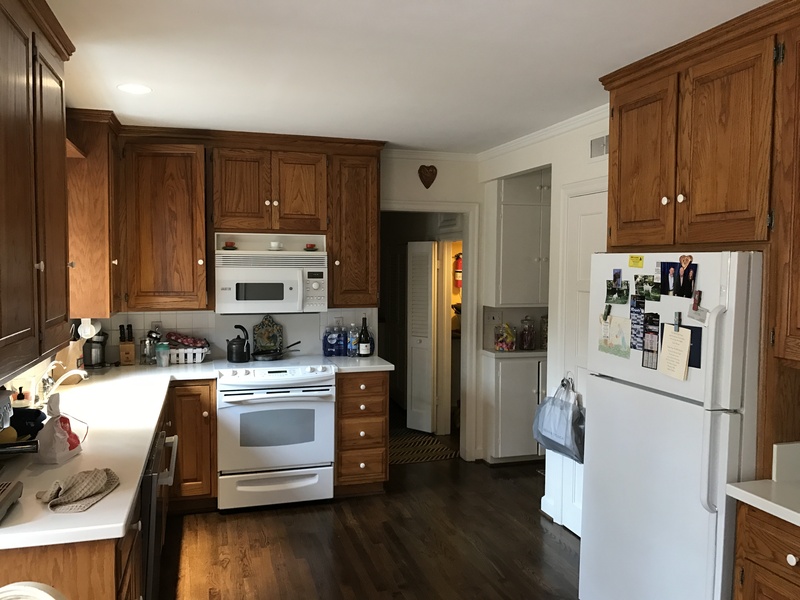 In the main area of the kitchen, we grabbed a few inches of space from the backside of an old hallway coat closet so that we’d have enough room to tuck in a Subzero refrigerator, flush with the wall in the kitchen. I mentioned before that I loved this house. Just as my own growing up, this home has the same beautiful 8 panel doors throughout. They just don’t make ’em like that anymore! The client chose these charming hinged pulls. I love how timeless they feel. It’s not very often that a client knows everything they want when they call us. However, it’s also not very often that they don’t have at least one thing that they’re absolutely certain about. 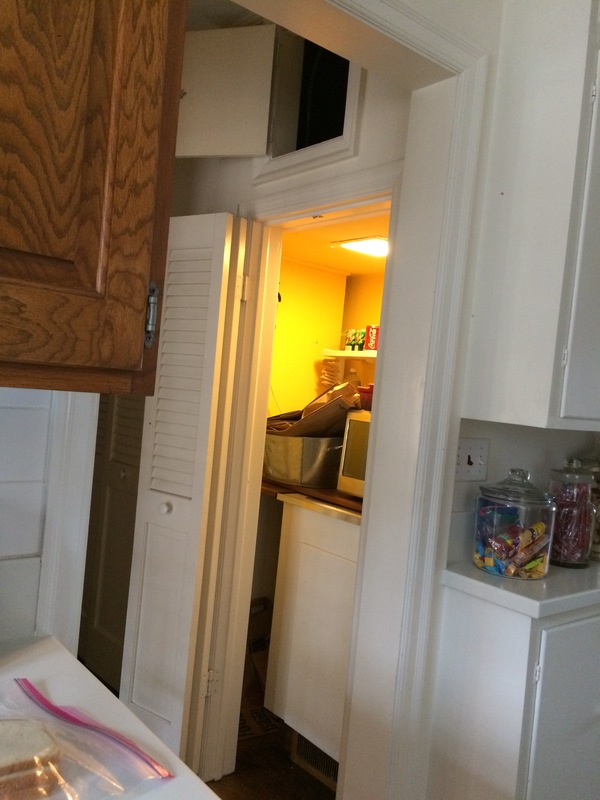 In this case, the homeowners were dead set on a slab splash that went all the way around the kitchen window. It was a little tricky to get the perfect cuts and adhere them all the way around the sill, but well worth it. In lieu of wall outlets, we installed plug molds beneath the uppers so that the slab would be entirely uninterrupted. This kitchen, like so many others we’ve been a part of, prove that you don’t have to turn a house on its head to come out with a great design. Bigger isn’t always better. Walls don’t always need to come tumbling down. If ever there was a kitchen that proved this true, it was this kitchen and this house. The house across the way. The house I walked by as a child nearly every day, and still do with my own children. Only this time, I no longer have to wonder what it looks like inside. I can see past the tudor’s brick facade and know just how beautiful the white marble kitchen is tucked in the back, with its pretty little wet bar ready for cocktails.